- Publisher Do You Love Me Even Now Dear God in Heaven, I come to You with mixed emotions. I know in my head that Youlove me -- I've read of Your love in the Bible; I've heard it preached in church;I've even felt it at times. But do You love me all the time? I don't really seehow You could. I mean, there are times when I feel as if I have ittogether -- when my life is in balance, when I've been kind to my family andcoworkers, when I'm having successes at work -- and I can see how You might love methen. But there are other times when I have absolutely nothing together. I'm living through one of those times right now. Myrelationship with my spouse is filled with tension, I've been snapping at mychildren all week, and I'm in a real slump at work. And the scary part of it is,I've lost confidence in my ability to make things right again. Somewhere inside me, I know that this distance I feel fromYou is a lack of trust in the power of Your love, but I can't seem to shake thisfeeling of separation from You. I've got to know. I need to hear from You. Do You love meeven now?Your Unlovable Child Dear Beloved, My love for you is not dependent on how you feel or whatyou've done. While I am a God who expects you to strive to please Me, I knowthat you are frail -- that you are made only of dust. I know all about you: yourweaknesses, your failings, your regrets, your doubts. I know these things, for Ihave created you. I know your thoughts before you think them; I know exactlywhat you are going to say before you open your mouth. I know the good and thebad of you, and yet I love you still. I love you because that is what I do -- it isMy very essence. My love is not based on your performance. It is Who I am. My love is unlike any earthly love you have known. For Mylove never fails. It is as vast as the heavens; it reaches beyond the clouds; itfills the entire earth. Though the mountains be shaken and the hills removed,yet My unfailing love for you will not be shaken. For I am a God who hascompassion on you. You ask if I love you even now. Yes, a thousand times over.Yes! I love you even now.Your God of Everlasting Love Isaiah 54:10"Though the mountains be shaken and the hills be removed, yet my unfailing lovefor you will not be shaken nor my covenant of peace be removed," says the Lord,who has compassion on you. 2 Peter 3:14Make every effort to be found spotless, blameless and at peace with him. Psalm 103:14He understands how weak we are; he knows we are only dust. 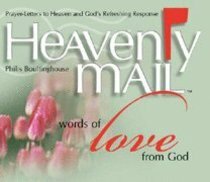 About "Heavenly Mail: Words of Love From God"
Do You Love Me Even Now Dear God in Heaven, I come to You with mixed emotions. I know in my head that Youlove me -- I've read of Your love in the Bible; I've heard it preached in church;I've even felt it at times. But do You love me all the time? I don't really seehow You could. I mean, there are times when I feel as if I have ittogether -- when my life is in balance, when I've been kind to my family andcoworkers, when I'm having successes at work -- and I can see how You might love methen. But there are other times when I have absolutely nothing together. I'm living through one of those times right now. Myrelationship with my spouse is filled with tension, I've been snapping at mychildren all week, and I'm in a real slump at work. And the scary part of it is,I've lost confidence in my ability to make things right again. Somewhere inside me, I know that this distance I feel fromYou is a lack of trust in the power of Your love, but I can't seem to shake thisfeeling of separation from You. I've got to know. I need to hear from You. Do You love meeven now?Your Unlovable Child Dear Beloved, My love for you is not dependent on how you feel or whatyou've done. While I am a God who expects you to strive to please Me, I knowthat you are frail -- that you are made only of dust. I know all about you: yourweaknesses, your failings, your regrets, your doubts. I know these things, for Ihave created you. I know your thoughts before you think them; I know exactlywhat you are going to say before you open your mouth. I know the good and thebad of you, and yet I love you still. I love you because that is what I do -- it isMy very essence. My love is not based on your performance. It is Who I am. My love is unlike any earthly love you have known. For Mylove never fails. It is as vast as the heavens; it reaches beyond the clouds; itfills the entire earth. Though the mountains be shaken and the hills removed,yet My unfailing love for you will not be shaken. For I am a God who hascompassion on you. You ask if I love you even now. Yes, a thousand times over.Yes! I love you even now.Your God of Everlasting Love Isaiah 54:10"Though the mountains be shaken and the hills be removed, yet my unfailing lovefor you will not be shaken nor my covenant of peace be removed," says the Lord,who has compassion on you. 2 Peter 3:14Make every effort to be found spotless, blameless and at peace with him. Psalm 103:14He understands how weak we are; he knows we are only dust. Philis Boultinghouse is the author of the best-selling "Hugs for Sisters" and several other books. She has served as managing editor for Howard Publishing since 1991. As a speaker to women's groups, Boultinghouse brings her understanding of the needs of women to her insightful writing. Married for thirty-two years, she is the mother of two grown children, Jason and Crystal.